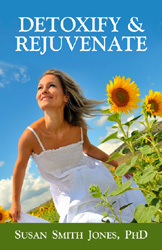 "You’ll want to get copies of each of my new booklets on natural remedies featured below. Through each booklet, you will learn more about how to create radiant health, and the many herbs I recommend for whatever ails you as well as the ones that I take everyday to stay healthy, keep my body in tip-top shape and celebrate life. These booklets make wonderful gifts of health to give to your family and friends for any occasion." 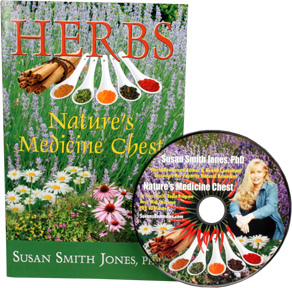 "In this booklet, my desire is to open my herbal medicine chest to you and share some of the most commonly used herbs and natural remedies for widespread ailments both minor and serious. In addition to imparting the insight of my grandmother, I'll also be discussing scientific studies that confirm the efficacy of herbs to treat specific conditions. Finally, I'll be answering some of your most frequently asked questions about the safe and effective use of herbal remedies." 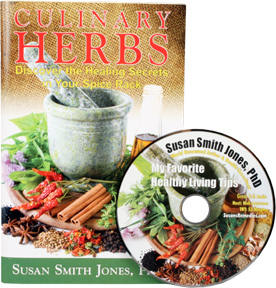 "In this booklet, I open my curative kitchen to you, giving you a spice-by-spice guide to their medicinal uses. I'll be discussing scientific studies that confirm the efficacy of spices to treat specific conditions. And let's not forget that spices offer a sensual journey for our taste buds! Though I am a vegan, I will include suggestions for using spices in both vegetable and animal dishes to fit any lifestyle. I'll also answer some of your most frequently asked questions about spice-based remedies." 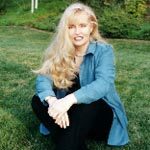 "In this booklet, I'll use my 30 years of expertise as a health educator at UCLA and my passion for healthy living to guide you toward the best ways to lose weight, stay healthy and keep the weight off for good. 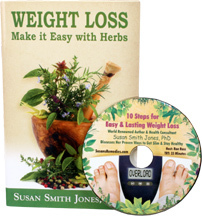 In addition to offering tips for an ideal exercise program and other essential steps for successful weight loss, I'll be discussing an array of herbs that, when taken along with a healthy diet plan and exercise regimen, can dramatically improve your chances of weight loss success!" "In this booklet, I'll be discussing scientific studies that support the efficacy of herbs to treat colds and allergies. You'll learn about the root causes of colds and allergies, practical tips for keeping your immune system strong, and about specific herbs that can support the immune system and relieve symptoms like cough, congestion, sore throat, and watery eyes. 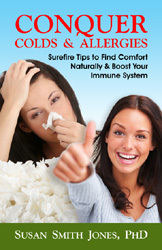 Colds and allergies may have no "cure," but this booklet will empower you to conquer them both!." "In this booklet, I go into great detail about the health impacts of the multitude of toxins we're bombarded with in modern civilization. You'll learn about how the body's detox system works, what it needs for optimal functioning, and how it is a crucial component in wellness and longevity. Most importantly, I'll be discussing foods, nutrients, and herbs that support every step of detoxification, from releasing toxins from the tissues, to neutralizing them in the blood, to eliminating them efficiently. I'll also be sharing with you the importance of rebuilding healthy intestinal flora after any detox program through probiotics. Finally, I'll answer your most frequently asked questions about the safe and effective use of foods and herbs for detoxification." 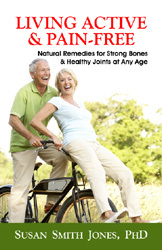 "In this booklet, you'll learn how you can give your body all it needs to build and maintain healthy bones and joints naturally, without drugs and side effects. I know a great deal about this topic not only because of my three and a half decades as a holistic health educator and expert, but also from my firsthand experience. Many years ago, I was in a devastating car accident that left me with a severely fractured back. My doctors told me that I would live a life of pain and never again be physically active. Refusing to accept their diagnosis, I turned to the power of nature's healing herbs, the commitment to heal and triumph over pain, and a good dose of faith. Six months later, my doctors were shocked to discover that my bones had healed themselves fully and I had no more pain! Today, I live an active lifestyle of hiking, biking, rollerblading, and Pilates, and I am ever grateful for the knowledge I gained about bone health and living pain free, which I now wish to share with you. In this booklet, I'll give you an easy-to-understand overview of the musculoskeletal system's components and functions. Next, I'll discuss the risk factors for and related health risks of conditions like osteoporosis and rheumatoid arthritis. I'll go on to show you how these diseases do not have to be a certain part of aging; with the right vitamins and nutrients, an active lifestyle that includes weight-bearing exercise, and a dash of sunlight, you can lay the foundation for a resilient skeleton and pain-free joints. Finally, I'll point the way to healing herbs from nature's medicine chest that can help stave off the degradation of bones and joints, minimize pain from arthritis, and help you feel years younger than your chronological age. I hope that after reading this booklet, you won't take the aging process "lying down"!"